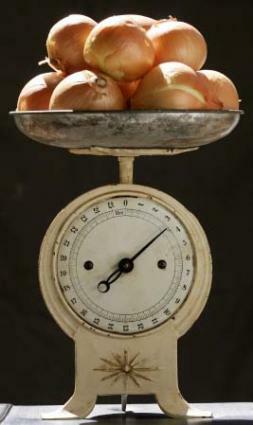 Antique food scales are a relatively inexpensive way to add charm and texture to your country kitchen décor. Be sure you do your homework on pricing, because often they are over-priced. Surrounding yourself with antique collectibles is a wonderful way to bring joy and warmth to your home - particularly when the collectible reminds you of past good times. Food scales can bring back thoughts of going to the butcher shop with Grandma to get that perfect roast for a special occasion dinner or stopping at the market to pick up a pound of coffee beans. Maybe your memories are from mom's kitchen when she would carefully measure each of her ingredients before cooking up a pot of berry jam. The large commercial scales from the deli or grocery store can be hard to find, but the smaller, home-style food scales are readily available in antique stores and at collectible auctions. A good home scale had to combine the accuracy of a professional scale with a homey style and size that would fit into a kitchen. Most scales were made of cast iron and were extremely heavy. The first home scales were basically smaller versions of scales in stores, bakeries and commercial kitchens. They were used by home cooks to measure food and recipe ingredients. Women who were following written recipes were more inclined to have scales that measured in small increments to allow them to have extreme accuracy in their cooking and baking. The early home scales date back to the wealthy homes during the Victorian era and were usually black with minimal shiny accents such as a brass balance beam. In the early 1900s, the use of kitchen scales started to spread beyond the homes of the very wealthy. By the 1930s, scales had become more widespread. Some manufacturers started to offer colored bases on their scales to match the kitchen décor colors of the time such as pastel yellow, green and cream. By the end of the war, most kitchens had a scale. All types of food can be measured in home kitchen scales including fruit, meat, spices and baking ingredients. The type of scale used depends on the accuracy of the weight desired. Some scales can measure a very small amount of an ingredient while other scales are better for a more estimated weight of a large volume of food. Mechanical scales have a large platform to hold the item being weighed. The platform can be flat or bowl-shaped. The weight of the item compresses a spring which, in turn, moves a needle on the big dial on the front of the scale to show the weight of the item. These scales are often made of a combination of metals including a lighter metal like tinplate for the platform and dial and a heavier metal like cast iron for the base. The maximum weight can be anywhere from one to twenty-five pounds. Scales from the Victoria era and early 1900s are relatively difficult to find and can command quite a price in excellent condition with all original parts. Scales from the 1930s tend to command a much lower price due to their widespread availability. Scales manufactured after 1950 usually only hold sentimental value since their lightweight construction and wide availability has decreased their value.If you are looking for the value of a specific food scale, check the antique area on eBay. Antique food scales are well-represented and you could discern an approximate value from the auction bids. For a more accurate valuation, consult a price guide at the local library or an expert at an auction house. Many experts are listed online and auction houses are included in local telephone books of major cities. Another excellent source of information on antique food scales is the International Society of Antique Scale Collectors (ISASC). For just a $10 fee, they will research a particular scale, providing information on the scale's manufacturer, year of origin, type, weighing principle and purpose. They can also provide an estimated value.